Martin Bambauer was born in 1970 in Wesel (Niederrhein). He studied protestant church music at the Robert Schumann Conservatoire in Düsseldorf (Organ with Hanns-Alfons Siegel and Professor Hans-Dieter Möller, Improvisation with Professor Dr. Gustav A. Krieg, Piano with Thomas, Palm, Conducting with Prof. Hartmut Schmidt and Prof. Volker Hempfling). After his final examination (Improvisation - with Distinction) he continued his organ studies with Professor Daniel Roth at the Conservatoire for Music and Drama in Frankfurt-am-Main, where he took his Concert Diploma (Konzertreifeprüfung) in 1999 and his Performance Diploma (Konzertexamen ) in 2001. His studies were enhanced further by numerous master courses with artists such as Olivier Latry, Ben van Oosten, Ewald Kooiman, Jon Laukvik and Marie-Claire Alain. 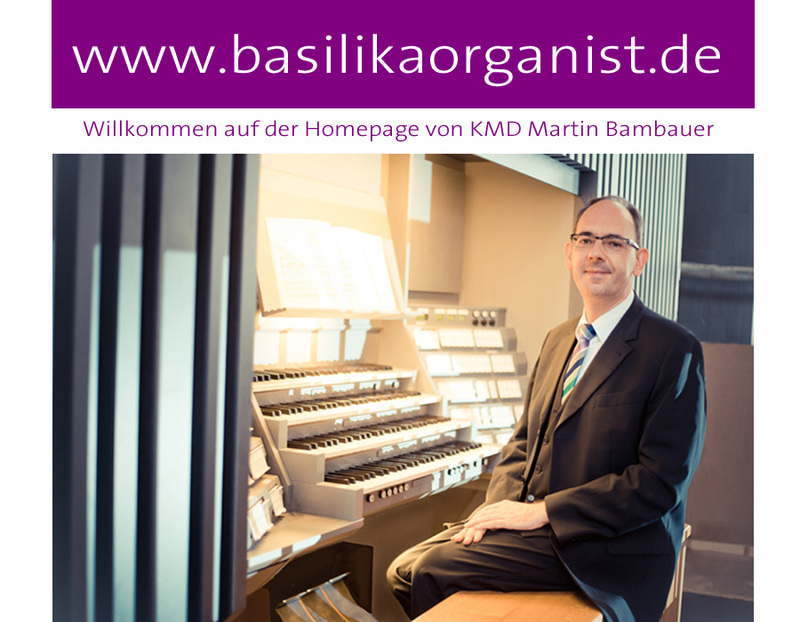 Martin Bambauer has won prizes at international organ competitions (for example in Elburg in the Netherlands in 1994, and the First Prize in the Organ Improvisiation Competition in Schwäbisch Gmünd in 1995). In 1995 he received the main award from 'Fugato'- the first international organ festival in Bad Homburg. Martin Bambauer has given organ recitals throughout Germany, including concerts at Ulm Minster, the Marktkirche in Wiesbaden, Altenberg Cathedral, the Abbey Church of Himmerod, Erfurt Cathedral, the castle church at Altenburg, the Kreuzkirche and Frauenkirche in Dresden, as well as in Switzerland, France (including the Paris churches of St. Augustin, Ste-Trinité, St. Sulpice and at Notre Dame Cathedral), Belgium, England (including the Cathedrals at Gloucester and Norwich), Scotland, Norway, Italy, Russia (Philharmonies at St. Petersburg and Belgorod) and frequently in the USA. On the occasion of the 100th anniversary of Maurice Duruflé's birth in 2002, he performed the composer's complete works for organ. Between March 21st 2010 (Bach's birthday) and New Year's Eve of the same year he performed the complete organ works of J.S. Bach on the Schuke Organ in the Constantine Basilika in Trier in a series of concerts and recitals. His artistic activities are documented on numerous CD recordings (available on the Aeolus, IFO, Motette / Ursina labels) - among them world premiere performances of works by César Franck on the Cavaillé-Coll organ at Carcassone Cathedral, which have been received with critical acclaim (Fono Forum, Musica Sacra). His recent recordings include the first two organ symphonies of Charles-Marie Widor at the Cavaillé-Coll organ at St. Sulpice Paris (Aeolus) and the first recording of the symphonic Eule organ at Konstantin-Basilika (Motette-Ursina). Martin Bambauer lectured in liturgical organ performance and improvisation at the Cologne Conservatoire between 2001 and 2008. He has conducted performances of works by - among others - Bach, Händel, Mozart, Beethoven, Schubert, Mendelssohn, Brahms, Bruckner, Reger, Elgar, Berlioz, Fauré, Poulenc, and Duruflé. He conducts the Trier Bach Choir and the Caspar Olevian Choir, which he established in 2000. He has been the Organist and Director of Music (Kirchenmusikdirektor) at the Constantine Basilika in Trier since 1999, and as well the Director of Music (Kreiskantor) of the Protestant Church Community in Trier. With the new construction of a four manual symphonic main organ for the Constantine Basilika (2014/87/IV/P) by the organ builder Hermann Eule (Bautzen) he has initiated a noteable European organ building project in a major historic church which is part of the UNESCO world heritage.